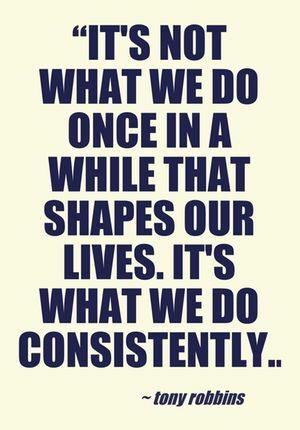 Consistency…this is difficult for me. I have the best intentions when I start something new but I can’t stick with it. A few years ago I bought the Insanity workout DVD’s and consistently followed the schedule for 2 1/2 weeks. Unfortunately, due to “poor form” I injured my ankle so I had to take a break. I never got back into it after that. The problem affects all areas of my life. Family, work, church, friends, etc. I think deep down I know what the problem is. Why is it so DIFFICULT to control ourselves? Maybe that’s why life tends to be harder for me. The Bible says we are unprotected due to our lack of self-control. That makes sense. If I controlled my impulsive desires and actually did the things that were beneficial to a healthy lifestyle being consistent would be easier.